Sometimes in order to exorcise your demons, you have to make a date with the devil. That certainly was the case for the Quinnipiac men’s ice hockey team on Saturday night. Quinnipiac (26-9-2, 14-6-2 ECAC Hockey) was able to hang on to a 2-1 win over the Arizona State Sun Devils (21-13-1) in the Midwest regional semifinals at the PPL Center in Allentown, Pennsylvania. Sophomore forward Joe O’Connor and freshman forward William Fallstrom scored the two goals for Quinnipiac, while junior goaltender Andrew Shortridge made 20 saves in the win. This comes after blowing two, third-period leads against Brown just a couple weekends ago and getting knocked out of the ECAC Hockey playoffs. The Bobcats would not face the same fate as they locked down and maintained their third-period lead to advance to the regional finals where they’ll face defending national champ Minnesota Duluth. 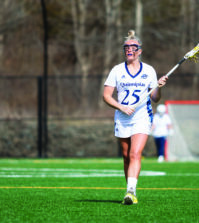 “I thought it was a hard game to manage for both teams,” Quinnipiac head coach Rand Pecknold said. “I thought we really came in the second, had some good energy… ASU to their credit put a really good surge late in the game. 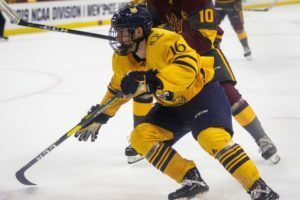 O’Connor opened the scoring for Quinnipiac when he spun then fired a shot that went straight through the legs of Arizona State’s Joey Daccord less than four minutes into the game. In the second, Quinnipiac was by far the superior team for most of the middle frame. After a few close chances, Fallstrom finally was able to crack Daccord again, as he collected a rebound and roofed it bar down to extend Quinnipiac’s lead to 2-0. Arizona State made a late push in the second, thanks to Quinnipiac’s turnover trouble. But the Bobcats would hold onto the two-goal lead heading into the final 20 minutes. That push continued on for the third period and the Sun Devils were finally able to break the shutout. Junior defenseman Brinson Pasichnuk walked the blue line and ripped one over the shoulder of Shortridge to bring the game to within one. 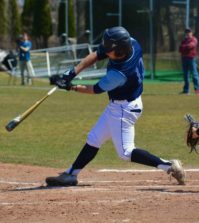 For a split second it appeared as though it could be a deja vu moment for the Bobcats. But the team locked down, and thanks in part to a late five-minute major assessed to Arizona State freshman defenseman Jarrod Gourley that put the Sun Devils on the penalty kill for the rest of the game, Quinnipiac was able to come out victorious with the 2-1 win. For Quinnipiac, one of the challenges was facing Daccord, a Mike Richter finalist for goaltender of the year. 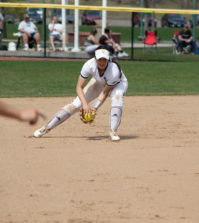 Getting shots on net and creating second-chance opportunities was part of the game plan going into the game. 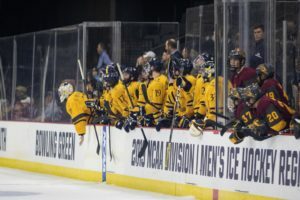 While Arizona State’s season comes to a close, Quinnipiac now will face Minnesota-Duluth, who defeated Bowling Green 2-1 in overtime earlier in the day, on Sunday, March 31 at 6:30 p.m. back at the PPL Center for a chance to go to the Frozen Four.